Don’t let age spots give you away; defy aging with this clinically proven Refining & Brightening Face Mask. 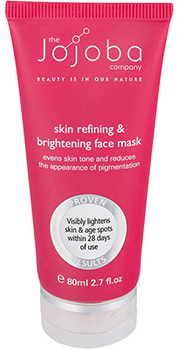 The Jojoba Company have created this mask using 96% natural ingredients. Rather than using harsh chemicals and bleach, they have taken skin lightening agents from daisy flowers and bearberry which are incredibly successful in evening out pigmentation, freckles and age spots. With a natural ivory clay base and with pure Australian jojoba, this mask will not dry your skin out like so many others can. Instead the ingredients have been chosen to hydrate and nourish the skin with repairing and hydrating vitamins A, C and E.
The Jojoba Company conducted studies into the Skin Refining & Brightening Face Mask and found brilliant results. The mask is clinically proven to visibly lighten the skin by over 20%, and proven to lighten the appearance of age spots by up to 25%. These results were see within just 28 days based on using the mask 1 – 3 times each week.